The Gibson Les Paul is one of the most recognizable electric guitars in the entire world. It has been at the forefront of contemporary music of many varieties, particularly hard rock and metal, for many decades now. If you’re interested in guitar in the slightest bit, it’s hard to go wrong with going after a Les Paul of your own. They sound great, have a timeless aesthetic, and they are reliable in every regard. There’s only one little downside: the price. Gibson takes the utmost care in manufacturing their guitars. They use only the highest quality materials available and they oversee the production of every single instrument as carefully as possible. With that kind of amazing craftsmanship at hand, the production process is rather expensive. As such, the end product also ends up rather pricey so that they can actually make some sort of profit and keep going at it. Many Les Paul models are over the $1,000 range. Because of this, many guitarists are forced to essentially shy away and chose other models. It doesn’t have to be that way, however. Knowing full well that not everyone has a few thousand to throw around at a guitar anytime they see fit, Gibson also produces considerably more affordable instruments under the Epiphone banner. All of their classic models are accounted for, including the flagship Les Paul. That’s precisely where the Epiphone Les Paul 100 model comes in. While the materials used aren’t always the same, and the manufacturing process might not be quite as exacting, Epiphone guitars still carry the Gibson seal of approval, and you’d be hard-pressed to tell them apart by looks alone outside of the name on the headstock. The Les Paul 100, in particular, is a gorgeous guitar. It even comes in a variety of finishes, including a classic cherry sunburst, ebony with sharp contrast thanks to the white pick guard, and a vintage sunburst. Rest assured, the iconic Les Paul aesthetic is in full effect from top to bottom. Of course, there’s still plenty to be impressed by when diving further into the nuts and bolts of the matter. The Les Paul 100 has dual humbuckers, just as any Les Paul should. Higher end models might use something like Seymour Duncan or EMG pickups, but these home brewed models still put out some serious tones. Besides, you can always switch them out for something else later on. The great thing about lower end instruments is that they make wonderful palettes for customization. Even so, after playing this model you may find you’re happy leaving it exactly as it is! There are four knobs, of course, allowing you the most control possible over the tone of each pickup. The selector is also in the classic Les Paul spot, closer to the neck, giving you immediate access. The entire setup will also allow you to pull off one of the coolest guitar tricks around: setting the neck pickup volume to 0 and switching between the pickups in the middle of a sustaining note or chord. This was perhaps most popularized by Ace Frehley, the former KISS lead guitarist. If you’ve ever seen guitars customized with a “kill switch,” this is the exact trick they’re trying to replicate. The rest of the guitar’s components are also perfectly admirable across the board. The body is made of mahogany wood, which has always been well known for its sturdiness and resonant qualities. The top is made of maple, and the fretboard is constructed with rosewood. There are 22 frets, and the overall scale is 24.75 inches. This all comes together to make the Les Paul 100 a great sounding instrument that also feels good to play. That in and of itself is perhaps the most important aspect of any guitar. The looks are important to an extent, but all is right with the world if it sounds good and you can enjoy playing it. Despite not being a full on Gibson branded Les Paul, anyone would be well served by adding this to their personal arsenal of 6 strings. The fact that it’s only $280 or so can be seen as the cherry on top. 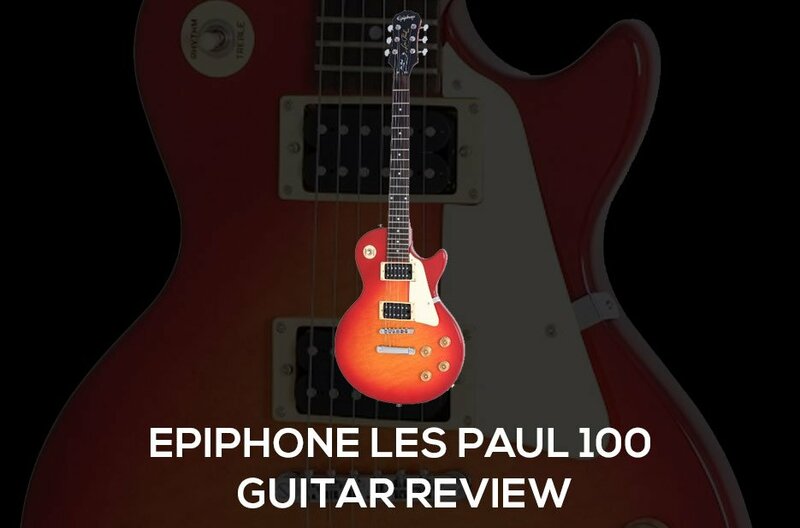 At that price point, you can view the Epiphone Les Paul 100 as a solid "second guitar." It may be a good idea to keep any first instrument in the $100 range, and this model, in particular, is a great entry into the larger world of higher quality guitars that are capable of a bit more and made with somewhat higher quality materials. Even with the best of the best often residing behind a rather tall pay wall in the $1,000 range and beyond, there are still plenty of great options out there for those with smaller budgets, and this particular model is the best bang for your buck around.